We do not take a one-size-fits-all approach. As an interdisciplinary team of lawyers, planners, policy analysts, and more, we can partner with you to customize policy strategies for your community. We know that every locality is different and needs tailored, strategic approaches. By analyzing existing policy environments, we help identify promising and innovative policy approaches that will yield the most improvements in health. We can offer you strategic counsel by reviewing your draft policies and providing feedback to help you meet your goals. We make sure that your policy is drafted in a way that has the intended impact you want, and that health equity is built in at every turn. Our approach ensures critical questions like financing and enforcement are addressed early on – setting up your community for success. We have the largest library in the nation of model laws and policies. Our online library offers states and localities legally sound, evidence-based policies with a proven track record of successful implementation. Our library also includes accessible fact sheets, how-to guides, infographics, and more on a wide variety of public health topics. Policy change can be complicated and sometimes hard to envision. We can help you optimally engage with your partners, so they can better understand the end goal of the work and see themselves as part of the team. 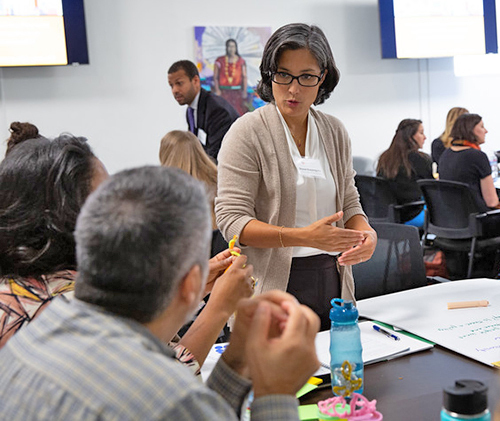 Our skilled trainers travel across the nation working with small to large groups on everything from understanding the importance of public health law, to training local health department staff on effective policy building to meet a specific policy goal. We provide the support to bring about the solutions you seek. We know that policy change needs to be backed by data and examples so that leaders can see what potential change could look like in their community. We create custom research and analyses tailored to the work happening in your community, including sample resolutions or ordinances, case studies on what other communities are doing, how to make the business case for policy change, methods for evaluating progress and impact, and more. Contact us to learn more about how we can assist your efforts.